I'm fascinated by how big TV shows are made. I'm interested in the white lies they tell. TV shows have to lie, because the truth is usually so boring. For example, X Factor probably should tell you that they find some of their acts on YouTube, and that everybody has several meetings before they're allowed near the stage. But you can see why the producers feel saying that would ruin the excitement of the show somewhat. One show which has been on my radar for a long time is I'm A Celebrity... Get Me Out Of Here! Unlike Love Island or Geordie Shore, everything about I'm A Celebrity is top secret. What are they hiding? After a lot of research, I found out that there are plenty of boring facts left out of I'm A Celebrity. Mostly though, what you don't see is how hard the production team work to keep the contestants as scared as possible. Here's what I learned after reading through interviews with production staff, past contestants and technical crew and after examining various video clips and photos. Note that I'm not connected to the show - if I was I wouldn't be allowed to write any of this - so I can't promise this is free of errors, but I have checked it against several sources. The truth probably changes slightly each year anyway. Where is I'm A Celebrity filmed? An easy one to start. Since series 2 I'm A Celebrity has been filmed in a place called Dungay, New South Wales, Australia. It really is the jungle - but what they try to keep quiet is that it's only an hour's drive from Gold Coast, a huge city and luxury tourist attraction. More on that later. The entrance is easy to find on a narrow street called Creek Road. The start of the very long driveway is visible on Google Street View. Much further back, a road sign refers to "I.A.C. speed limits" (that'll be I'm A Celebrity) and "Granada site" (ITV Granada used to produce the show). The TV studio can sometimes be seen on Google Earth (search -28.25605,153.34984, and somebody has drawn the famous bridges on OpenStreetMap. 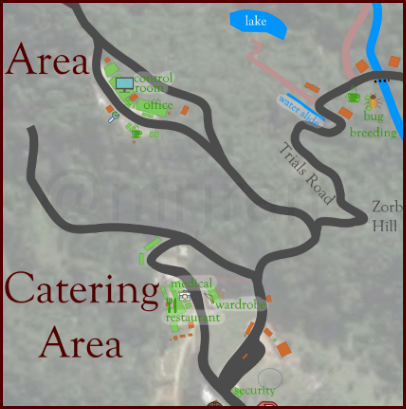 The address is 366 Dungay Creek Road (offices) and 486 Dungay Creek Road (studio). The set is covered by trees (and parts get covered up to keep things secret), so for more information you have to dig a lot deeper. And I have done just that. The tracks shown are the roads and main walkways. THe paths and roads have been heavily exaggerated for clarity which makes it look a lot busier than it really is. 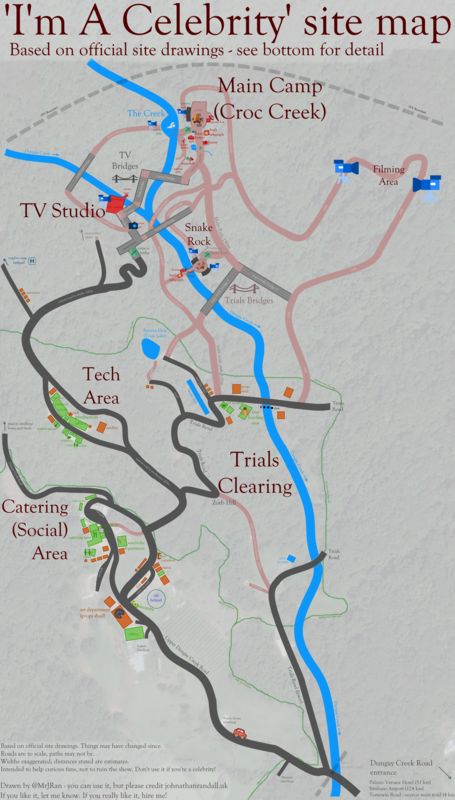 The key features are to scale but the secret routes are not. Distances are very approximate using my data and Google Earth's ruler. I have labelled as many features as I could find. 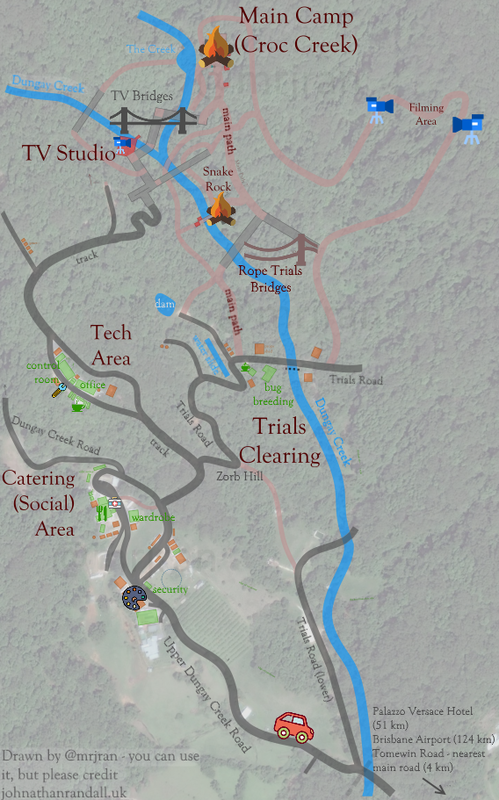 In a way, the internet has spoiled the fun, as while this map might be good for curious fans of the show, it would ruin the whole point if future contestants start Googling the address of what's supposed to be a mystery place in the middle of the jungle. Don't do that, celebrities. ITV has a contract to use the site until June 2020, but they have already extended it many times so another extension seems likely. If they don't, they have to take everything down, including the bridges. Is the I'm A Celebrity Camp Real? The camp was built for the show, and every year it changes slightly. In 2008 they even had a double-decker bus in the middle of the camp for some reason, and that's pretty unrealistic! There is a bit of debate online about whether the camp is filled with fake rocks made of papier mache or not. Whether or not that's true, we know they have to build places for cameramen and security to hide - the show itself admits that cameramen hide metres away from the camp. Also, we shouldn't be surprised that things have been put there for the cameras, after all, camps don't just appear in the middle of the rainforest! What really matters is whether the celebrities notice the props and the cameras. Of course they do. In the main camp, one side has a big wall made of rocks. Even the most unobservant celebrity must have worked out that this is where the cameras are hidden. I don't know if you can actually see them, but they will know they are there. There is at least one camera (used to film the celebrities waving at the bridge) which can be seen on TV. More importantly, the celebrities are forced to wear a mic pack to record what they are saying (there are microphones hidden around the camp as back-ups, but these record all the background noise too which would get annoying if you were sat at home trying to listen). These mic packs hang round their necks and attach to their belts, and are a right nuisance every time you get changed. Add this to the fact that they're waking up in the middle of the rainforest, and they definitely know they're being recorded. In truth, after a couple of days of being recorded without being told about all the embarrassing things you've done, the contestants probably do start to let their guards down and say things they wouldn't normally say in front of a camera. In early versions of the show, the celebrities would be seen talking directly to a camera man. This doesn't happen now, unless it's a trial or a challenge which are a completely different kettle of fish. The waterfall is one of the most fake parts of the camp. In the past, a real (and very sexualised) shower has been used, but now they use a waterfall which apparently can be very cold. It's powered by a pump which gets switched off in the afternoons. Although the celebrities have to find their own wood for the fire, it has already been chopped up and left around the camp area. There would be safety and environmental issues letting them roam through the jungle chopping down their own wood. The most fake part of the camp is the large roof, which protects the fire from the rain and the stars from the sun. This shouldn't be a surprise seeing as the food is delivered from there, and it means they have somewhere to go (and stay in front of the cameras) when it pours it down. Apparently it doesn't cover the beds. Is it really a jungle? Tweed Shire Council always put the word 'jungle' in inverted commas whenever they talk about it, as if they don't really believe it. And they should know - they own it! The term they use is "lowland subtropical rainforest". It is definitely very different from countryside in the Surrey, which is all that matters. Ultimately, the producers go to great lengths to make the contestants feel like they're lost in the middle of nowhere, even if anyone with a map would be a bit sceptical. Do the celebrities communicate with the outside world? About 10 days before the show starts, the celebrities arrive in Australia and are locked in a luxury hotel, where their phones are taken away from them. This means they don't get to read about all the other people taking part in the show, or find out what people think of them. It also explains why they get so emotional during the 'letters from home' segment (sometimes it happens only a couple of days in to the show, but you have to remember they've already been away from home an additional two weeks). Once they're in the hotel, they cannot communicate with the outside world. They don't even know what the time is: in fact anybody who is near them has to cover up their watches to keep the time a mystery. In a serious situation, the producers would of course speak to a contestant privately about the news. Even the late arrivals are held in the hotel from before the show starts, until they go in - if they even go in. Is I'm A Celebrity dangerous? The trials are a controlled environment. The animals used do bite, but obviously aren't going to put anybody's safety at risk. The aim is to scare the participants, not to kill them! This sounds obvious and is what we all think when we watch it at home, but it's quite likely that when a celebrity is forced to share a small box with a crocodile the words "they wouldn't pay the legal fees" escape from their minds! In the camp itself, dangerous snakes and spiders are regularly found and moved away. The celebrities are trained on what not to touch, and are expected to behave responsibily. The cameras are used to watch for any really dangerous creatures, and camouflaged security guards are sent in to deal with them. It's quite likely that there are a lot of medical issues related to being bitten, lack of energy, fear and stress and heatstroke among the celebrities which Medic Bob has to deal with, but which are never shown on TV to preserve a bit of dignity. There is a small medical room close to the camp where cameras aren't allowed. The reason the celebrities wear red socks is supposedly so the blood doesn't show. The crew are regularly receiving treatments for their bites too. Most of the injuries we see on TV are caused by the celebrities messing around. Unlike the Big Brother house, the jungle has plenty for you to trip up on. Do the producers interfere with I'm A Celebrity? Unlike some TV shows, the producers want the relationships and arguments between the contestants to happen naturally, and they avoid doing anything if you can help it. They still have to get involved though. For example, have you ever wondered how on earth the celebrities get to the trials and challenges? It's not luck! The walk from the camp to the trials clearing takes about 15 minutes, and the trials area itself is huge. A member of staff is sent to guide the celebrities around the site. Presumably they are also there to call for help in an emergency, as when there are no cameras nobody will know if somebody has fallen. It's not clear how close to the camp these production staff meet them. Some sources say that the staff are absolutely silent and refuse to speak to them, while others say the staff try to get them more scared before the cameras go live. It probably depends on who's doing the trial and which staff are available. The whole camp site is fitted with speakers, which, via a very long cable, go back to the main gallery. This is I'm A Celebrity's 'Big Brother voice' - but you very rarely see it on TV. The 'Big Brother voice' is used to call celebrities into the Bush Telegraph, to issue safety warnings, and presuambly to make sure everybody's sitting ready for Ant & Dec to come in (it would be a bit awkward if somebody was in the shower!). The celebrities are also free to visit the Bush Telegraph whenever they have a concern. We see a bit of this on TV, but there is a lot more of them being genuinely unhappy or worried which is cut out to preserve their dignity. The celebrities have to talk into a camera, while a voice in the gallery replies to them and tries to calm them down. The little clips of the celebrities walking to a trial or meeting each other for the first time are needed so that it all makes sense when you watch it at home. It's very likely that they will be asked to do it again if the first one wasn't quite right. That's a bit different to fakery (it would be fake if they told them what to do), it's just that they need a good clip of it. What's the I'm A Celebrity camp like? Most people who visit say it's a lot smaller than it looks on TV. You have to imagine 12 people living together in one tiny room. At one end of the camp (by the water tanks) there are two paths. The one on the right (as seen on TV) goes down a steep set of stairs to the creek, water pump and, if you keep going, the part by the bridge where they wave at whoever's leaving. To give you an idea of height, the creek is in the area underneath the suspension bridges Ant & Dec walk over. This path was extended in 2015 to add a quiet area by the stream (creek) for sunbathing or gossiping. It was added because the treehouse / sofa on the other path hadn't been used as producers had hoped. The path on the left goes past the sofa area, Bush Telegraph, the dunny, the camp exit, a pond and the shower and bath. If you keep going along this path, you'll pass the exit for Snake Rock and eventually come out at the Trials Bridge. It's not clear how far the celebrities are allowed to wander, or if there is anything telling them to turn around. In series 2, the angry celebrities tried to escape via the bridge, and panicked producers ran down the path to meet them. Other people have said that camouflaged security staff jumped out of the bushes and gestured that they needed to turn back. The dunny is basically just a bucket. There are steps around the back, where the 'bucket' is then taken out. The celebrities only have to carry the bucket to a secretive "agreed location", where producers meet them and carry it from there. This is a great example of a chore which the celebrities needn't have to do - the producers end up taking it anyway - but they make them carry it to add to the torture of the show. The water the celebrities drink has various bugs and diseases in it, and has to be boiled for several minutes first. Sometimes, they have to get the water from the creek, but because this was so low a pump was installed instead. When they get to camp, the water is stored in the brown tank. After being boiled, it goes in the green tank. The Bush Telegraph appears to have another door at the back. Presumably producers can use it to drop off things they will need, like toilet roll. There is no changing area, but producers talk about a 'modesty smock' - a sheet with a hole in it - which is used instead. What are the celebrities given? In the middle of the camp is a green box which is used to store the rice and beans, crockery and cutlery. The celebrities are also given cheap razors, sanitary towels, cigarettes, creams, medication, first aid equipment, soap and bio-degradable shampoo and washing detergent. They also appear to be supplied with deodorant, though this is rarely shown on TV. What is the Bushtucker Trial clearing like? The clearing is a former banana plantation. On TV it often looks rainforest-y, but they are very careful about which bits they show to the cameras. It's actually quite barren. Each Bushtucker Trial is like a Hollywood movie set. You have a load of cameras including some on cranes, big and bright lights, TV monitors, various technical and safety crew, and a car park used to get everybody there - not to mention the trial itself and all its exits used to pull somebody out in an emergency. In fact, seeing all this action must be quite a shock for a celebrity who has been living in a tiny camp for two weeks. Apparently that's why they always look either very excited or very shocked when they see the trial for the first time (and I'm told that part really is the first time they see it). Most of the bugs used in the trials run off in to the bushes, and this can create quite a smell. Especially when you remember that several rehearsals will have already been done before the celebrity arrives. Some of the trials are so big they have to be filmed a long way away. The cars used to move the celebrities around the site have blacked-out windows, to stop them seeing what else is going on, and the radios are switched off. The trials themselves are much more difficult than they look on TV, but I think most of the competitors reach a point where they have so much on their minds that focusing on the trial gives them some light relief. 'Medic Bob' is responsible for the meals, and uses a meal plan worked out in advance. He then adjusts it slightly depending on how many stars are won. The lack of food, lack of energy, and lack of things to distract you from thinking about food, is what most contestants talk about. It is very hard. There are no secret burger vans for the celebrities. What is the I'm A Celebrity TV studio like? The TV studio Ant & Dec use is nicknamed the treehouse. It is a two-storey building built on scaffolding, with the big open area we see on TV being 20 metres high on the top floor. Underneath it is a technical area and various storage facilities. There are steps up to the 'birds' nest', the balcony area we sometimes see Ant & Dec standing on. This is also used to film the bridges. The studio itself is small and, as studios go, quite empty. The furniture has to be moved around during the show. The after-show (Extra Camp / Get Me Out of Here Now!) uses the same studio, and the furniture has to be quickly moved in between the two. In one corner of the studio are two bridges. On the right (as seen on TV) is the exit bridge (where the fireworks are), which leads to another bridge, then some steps, and eventually the exit. On the left is the first of three bridges over the creek to the camps. Apparently if you sit very quietly in the dunny you can hear some of the shouting from the TV studio, but not enough to know what's going on. The crew have to be especially quiet when using the bridges which get very close to the camp. This describes five of the bridges. The sixth is the rope bridge used to get to the trials area. Some sources claim there are actually 10 bridges: if true, these will be small rope bridges used to help carry equipment from the main road to the camp and challenge areas. Producers use golf buggies to get around between bridges. When not in use the props are stored in the shed. What luxury items do the celebrities bring? The celebrities are allowed to bring one luxury item. This must not be food, music, games, reading material, ear plugs, or anything you couldn't carry on your own. Often the families can send them a second gift. What happens to the families? The families and the evicted contestants stay at the luxury Palazzo Versace in Gold Coast. The families are flown here a few days before evictions start, and a meeting is held on the last night. Every morning a bus then takes them from the hotel to the catering tent, where they watch the TV show. If their celebrity is evicted, a truck then takes them up to the press pit by the studio. After the eviction, they have to visit the doctor, and usually stop for food. They are then followed back to the hotel by a camera crew, and once they've settled down they then record several interviews. This is not the same hotel as where Ant, Dec and the senior crew stay. They use buildings in Dungay which are rented, while the rest of the crew use one of seven local hotels. How do the celebrities prepare for the jungle? A long 'shortlist' of potential celebrities is drawn up every Spring. This is then narrowed down via various meetings and conversations. To be confirmed for the part, the celebrity must pass a medical and a psychological interview which covers their fears and anxieties. These days the producers appear to go to great lengths to stress how tough the show is, as they have become fed up with 'divas' signing up and then refusing to take part. They send everyone an info pack with a DVD, and hold what they call a "meeting of doom". The celebrities usually fly into Brisbane Airport, which the paparazzi have worked out and lie in wait. Once they're in the hotel, and with all communication cut off, they film various interviews for the show and the press. They have meetings with producers, wardrobe and Medic Bob about how to stay safe in there and how to prepare. The answer to preparing is to get used to having an empty stomach - but with room service on demand that advice probably gets ignored! During this period, information about what's actually going to happen is kept deliberately vague to keep them nervous and excited. Some people say there were only given a couple of hours notice that the car is coming to take them to the jungle. Incidentally, the famous clip of the helicopter doing loops around the jungle is done for two reasons. Firstly, it looks good on camera and has become a big part of the show. But secondly, it helps disorientate the contestants so they don't realise they are only a 15 minute flight from Brisbane. Every little detail has been thought about. Even once they've landed, they are carried around by blacked-out cab. They never enter via the bridges, which would kill the illusion by making it obvious how close the TV studio is. Ant & Dec often say the winner has to be naturally funny, and naturally nice. Fakes will get caught out. Most importantly, you have to be popular. If you work for I'm A Celebrity, your job is to make sure the show gets as many viewers and as many tweets as possible. This means they will always give the most popular people on screen, give the most popular people the best challenges and talk about the most popular people more. People won't vote for people they haven't seen much of. This doesn't mean that the most popular person before it starts will always be the winner - although Harry Redknapp did that. Often the winner will be somebody young and energetic, who started out nervous and grew stronger as time went on. The public like that sort-of thing. How recent is the footage we see on TV? One of the reasons Australia was chosen as the setting for the show is that the time difference fits perfectly. Once the celebrities go to bed, you have about seven hours to get the show ready (obviously they'd have started working on most of it earlier in the day). The only part which causes issues is any action which happens when the celebrities wake up, two hours before the show goes live. This would be shown at the start of the next day's show. They claim that all of the footage used on the show is less than 27 hours old. In practice I'd expect some old clips to be kept handy in case there's a slow news day. A special mention should be made for the 'eviction trick'. For years, filming the evictions (and the final) has been a problem because it takes 10 minutes to walk from the camp to the studio. For the last couple of years, they have got round this with a very clever trick. As Ant & Dec are leaving the bridge, they show us a clip. After the clip is an advert break. During this, they go in to camp and tell them who is leaving. After the break, we are shown who is leaving but by now it's five minutes old (and the big 'live' icon is covered up). Next thing we see is a clip of the celebrity walking over the bridge, and then we see Ant & Dec back and live in the studio! How much do the celebrities get paid? The show used to claim that the celebrities did not get paid, and only got compensated for lost earnings. Several tabloid stories have proven this wrong, but then things have changed a lot - it used to be about raising money for charity. The phone lines still do contribute to charity, but it's not as big a deal as it used to be. The amount the celebrities get paid appears to vary between £13,000 and £600,000. It all depends on what they will bring to the show, and how much the show is willing to spend. What time do the celebrities get up? When the show is filmed, sunrise in Australia is about 5am, and this plus the sound of the wildlife wakes them up. By the time the TV show goes live at 7am local time, they are all up and moving. Presumably the tannoy would be used if the celebrities refused to budge! Immediately after the TV show is filmed, the Bushtucker Trial takes place, so let's say that goes from about 9am until 12pm. Sunset is about 6pm, which is around when the challenge is filmed, and the food comes after. 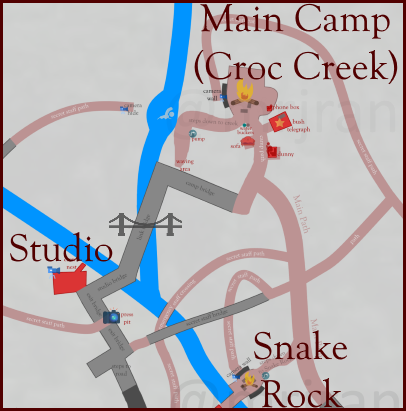 Can you visit the camp? No. Between the British and the German versions of the show, the rehearsals and the preparation work, the site is in use most of the year and is protected by security at all other times (called 'the hibernation period'). It's not a place for tourists! Technically the site isn't really fenced off and paparazzi have tried all sorts of tricks to try to get in, but it's tough to get anywhere near it and they always get caught. Do the producers really use that ridiculous name? Most internal documents I have seen simply call the show "IAC". It would be a nightmare if your job involved writing the full name on every sheet of paper! Sometimes it's called "IACUK", to differentiate from the German version of the show which is filmed in the same place. How many people work on the show? Approximately 550 local Australians and 150 British employees work on the site every year. The most unusual job opportunity is the role of dummy campmate. Every year, before the show goes live, a dummy version of the show is filmed with ordinary Australians who are paid to be the contestants. At first I thought this was just used to test all the cameras are working and that the crew can remember where to point them, but apparently it's used to test everything which is coming up that series. You have to wonder how much that dummy run costs and why all the footage gets binned - it's probably just as good as the real thing! The reason why I write all of this is because I find it fascinating that there is no 'meta-show'. What I mean is this: if I had just moved in to the jungle and somebody came back from a Bushtucker Trial, the first question I'd ask them is "where did you have to walk to?". Followed by "who did you meet? ", "was Richard (the producer we met in the hotel) there? ", were the staff nice? ", and so on. You can be sure those conversations do happen, but they get cut out the TV show because they are too boring and they spoil the 'lost in the jungle' atmosphere with their pragmatism.